New Year; new look; new features. I’m not talking about the latest Hollywood trends. Rather, I’m referring to all the great things that Vital Interaction™ has in store for its customers this new year. Our team makes both research and customer engagement a top priority so that we can we can better serve Vital Interaction™ system users. And our most recent research and engagement efforts have underlined the role of advanced healthcare technology tools in enhancing patient-centered care. With that in mind, we’ve developed a handful of leading-edge tools to help medical practices improve patient engagement and care, while reducing costs. Let’s take a look at some of our newest system features and how they stand to benefit your practice as well as your patients. 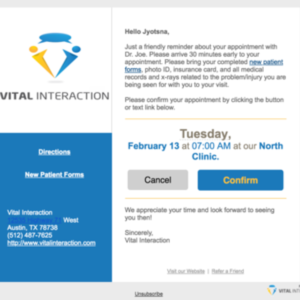 At Vital Interaction™, we strive to offer patient-centric communication tools that address our customers’ key issues. 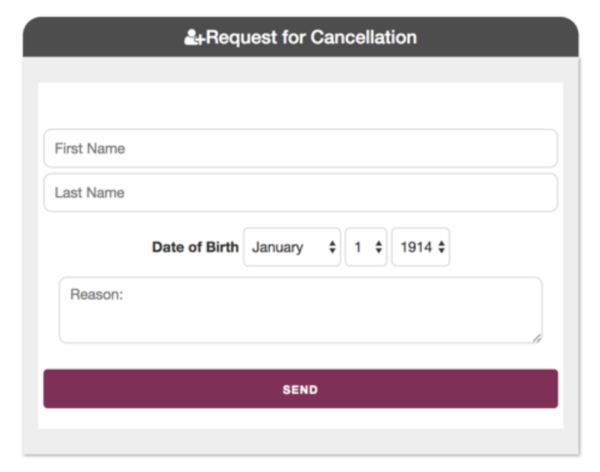 One of the newest features that we recently unveiled is our two-step cancellation feature. We made—and then further refined—this tool after speaking with several customers, who informed us that many patients were accidently declining/canceling their appointments when they meant to confirm it instead. To alleviate this problem, we incorporated a second step to ensure accurate appointment cancellations. Now, patients are prompted to click the ‘Cancel’ button, which takes them to a new page, where they add their name and birthdate to verify the cancellation. In addition to streamlining the appointment cancellation process, this new feature also gives your emails a slightly new look: You can either replace the appointment ‘Decline’ button or add a Cancel button in. Now, when a patient cancels his appointment in either an email or text message, your office won’t have to call him to verify that he meant to do so. Instead, you can simply cancel the appointment in your EMR* and fill in that time slot with a patient you may have on the phone, for example. *NOTE: We offer auto-cancellations for certain EMRs. To learn more, contact our Support team or your account manager to see if that’s an option. While patient-centric tools are necessary, so too is having a sleek patient communication system in place. With that said, an up and coming feature we’ll be rolling out in the near future is our system’s new Modern view option. We wanted to offer a cleaner, simpler look to optimize how you interact with our products. Don’t worry, though—you’ll be able to switch back to the Classic view for nostalgic reasons before we permanently update systems with the Modern view. While our Modern view hasn’t been finalized, here is a sneak peek to tide you over: If you’ve already incorporated our new two-step cancellation feature, you’ll be introduced to our new site and look a lot sooner. For practices using EMRs with this compatibility, you will cancel your appointments through our new interface in the screen below. 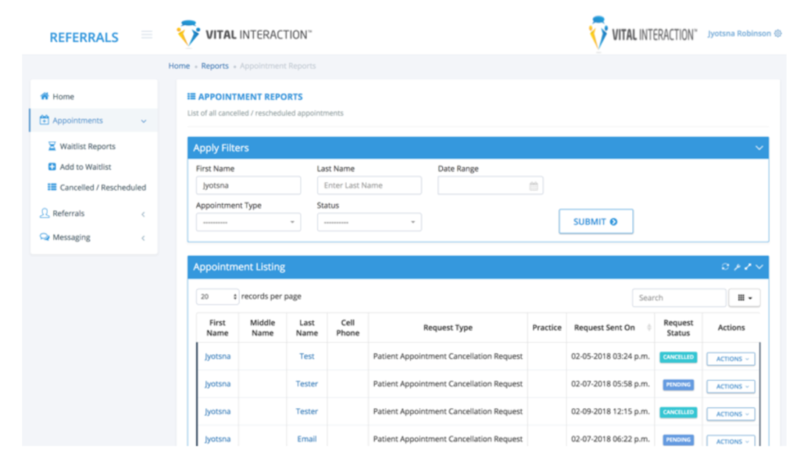 The Care Coordination tool is particularly helpful for managing your referral list and waitlist patients—as well as those patients needing to be reactivated. With our new Bulk Messaging tool, you can easily upload a list of patients to our system to notify them of unexpected news, such as the addition of a new provider or the opening of an additional office. Our new look and new features uniquely position you to tackle communication snags while enhancing patient care. It’s our mission to provide the patient communication and management tools medical practices need to deliver and/or enhance patient-centered care. And we’re always open to new ideas from our users—you might just see your suggestion made a reality. To learn more about our newest features, contact your account manager today. 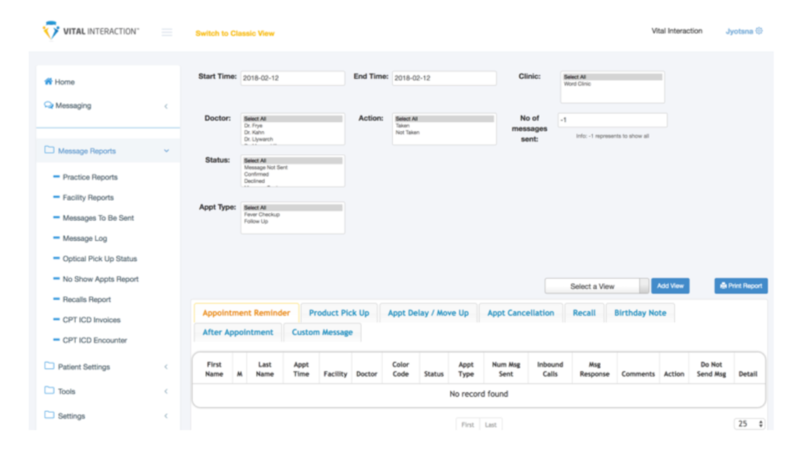 Our Automated Patient Interaction System offers a wide variety of tools to help medical practices enhance patient care and improve patient engagement while reducing operating costs. Discover the Vital Interaction™ difference—get started today by calling (512) 487-7625.